Ed tech startup Derivita today launched its new online homework system, a computer algebra tool designed to provide an affordable alternative to traditional course materials. The technology was created by Instructure co-founder Devlin Daley and ex-Google engineer Ryan Brown. 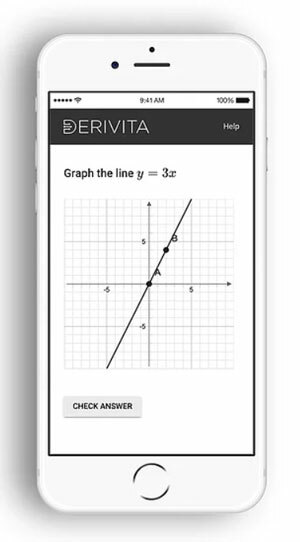 Derivita can be used with any textbook or open educational resource, providing "deeper and more complicated question types to elevate math learning," according to a news announcement. Its assessment tools give personalized feedback to students based on their responses and provide additional help in areas where students are struggling. A teacher dashboard provides an overview of topics that need more instruction in class. The system is fully accessible, can be used on mobile devices and integrates with a school's learning management system. "Math is a leading predictor of student success when it comes to completing a college degree, but universities are still delivering math courses with outdated technology because they haven't had any better options," noted Devlin Daley, co-founder of Derivita, in a statement. "What's worse is that students are paying a premium for it. Derivita is a much more functional and affordable resource for math students and teachers — we don't know of any other tool like it." Because Derivita is not tied to a particular book or class, students save money because they are free to buy used textbooks and resell them without losing access to the online homework system, the company said. For more information, visit the Derivita site.